Sitting high above St. Mark’s Square and visible from the Grand Canal, the remarkable clock in St. Mark’s Clock Tower (Torre dell'Orologio) has served as Venice’s official timepiece for more than 500 years. Touring this historic symbol of the city is a highlight of any visit, not least for the sweeping views from the top of the tower. A unique landmark of Venetian architecture, St. Mark’s Clock Tower is part of a 15th-century building featuring the central tower thought to be designed by Mauro Codussi flanked by two shorter wings on either side. The clock mechanism has changed over time, with a later addition of panels with Roman numerals and Venice’s winged lion symbol, but the two large bronze figures that strike the hours on a bell, the copper statues of the Virgin and Child, and the clock face are all original. The clock displays not only the time of day but also the current zodiac sign and phase of the moon. A visit to the clock tower is generally included in tours of the highlights of St. Mark’s Square (Piazza San Marco), including St. Mark’s Basilica, Doge’s Palace (Palazzo Ducale), and the bell tower; skip-the-line tickets are a must for these popular sights. Tours include an explanation of the internal clock mechanism and a climb to the top of the tower. 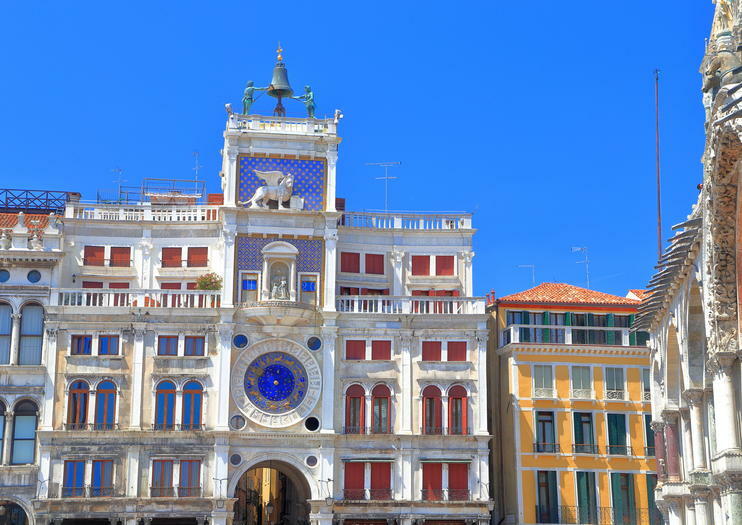 Venice clock tower tours must be booked in advance and are led by a specialized guide. Children under six years old are not allowed. Due to small spaces and steep stairs, the clock tower is not accessible to wheelchair users. St. Mark’s Clock Tower is located on the north side of St. Mark’s Square, in the center of Venice. The nearest vaporetto (water bus) stop is San Zaccaria. Venice is one of the most popular destinations in Italy, and can be very crowded in the summer. The best time to visit is from October through March, when the sights around St. Mark’s Square are more pleasant to tour. One of the most unique features of St. Mark’s Clock Tower is the procession of the three Magi—statues of the three Wise Men led by an angel that emerge from a small doorway to pass in front of the Virgin and Child statues. This happens only twice a year, on the Epiphany (January 6) and on Ascension Day (40 days after Easter Sunday). No visit to Venice is complete without taking in the Doge’s Palace, but this Gothic masterpiece has vast sections that most visitors never see. With this tour, enjoy VIP access behind the scenes to explore the palace’s secret archives, torture chambers, and attic prison cells with a guide. Afterwards, enter St. Mark’s Basilica with skip-the-line tickets to admire the mosaics before taking a turn through St. Mark’s Square and past the Bridge of Sighs. The ideal introduction for first-time visitors, this classic walking tour combines the blockbuster sights of history-packed Venice with a relaxing gondola ride. Listen to legends and stories from the city’s Renaissance heyday as you travel down cobblestoned streets and over picturesque footbridges. Tours cover Saint Mark’s Square, Doge’s Palace, and the legendary Calle Varisco. Get to know Venice on street (and canal) level on this half-day walking tour, originating at St. Mark's Square. With a guide, stop by highlights such as the Clock Tower, the Bell Tower, the Doge's Palace, and the Basilica of St. Mark's while listening to engaging commentary on Venice's history. Skip-the-line entrance to Doge's Palace and St. Mark's Basilica included. Discover the best of Venice by and by water on a combo walking and gondola tour. Stroll through the charming squares and narrow backstreets of the historic city center with a guide, learning the fascinating history of the Venetian Republic along the way. Explore highlights of St. Mark's Square and other landmarks like Santa Maria Formosa church and the Mercerie, and then hop into a classic Venetian gondola for a 30-minute ride through the city's captivating canals. Uncover the secrets of ‘Serenissima’ on this small-group walking and boat tour of Venice. Break away from crowds to explore the city's charm by land and water, beginning with a stroll through the enchanting squares and sidestreets of the Castello district. Then, board a motorboat for a cruise through the city’s famous canals, culminating at the bustling open-air Rialto Market. Feel like a VIP as a private guide shows you Venice’s must-see attractions, starting with a personalized tour of the monuments of St. Mark’s Square. Learn the long, illustrious history of the Venetian Republic inside the Doge’s Palace and glittering St. Mark’s Basilica, and then cruise across the lagoon for a look at the glass-making heritage of Murano island. All water taxi service is arranged for a seamless half-day adventure. Crown your dream of love in the most romantic country in the world, spend your honeymoon in Italy. Grand Tour: all you need to know about Italy! Rediscover Italy in a tour that get back the tradition of Grand Yours, the great journeys of young Europeans of higher class. Admire the most beautiful cities in the country in a trip.